Toshiba’s new Cinema Series for 2010 includes the WX800 line of 3D LED HDTVs. The WX800 3D series is compatible with Blu-ray 3D specifications, and of course requires 3D glasses manufactured by Toshiba. The WX800 series is available in 55-inch and 46-inch sizes and Toshiba boasts the line as their “most meticulously designed and engineered [HDTV] to date.” The WX800 series supports multiple 3D input formats, including MPEG4-MVC, RealD, and others Toshiba didn’t name. Features include DynaLight-controlled 7M:1 contrast ratio, ClearFrame 240Hz frame rate, and built-in Wi-Fi (supporting Netflix, VUDU, Toshiba’s NET TV, and others). The 3D WX800 TVs will only work with Toshiba’s just released BDX3000 3D Blu-ray player — another first for the company. The 3D Blu-ray player supports full 1080p resolution at 24 frames-per-second and also has built-in Wi-Fi and app support. Audio formats include Dolby TrueHD and DTS-HD Master Audio. Yet another proprietary 3D system enters the market. Why Toshiba is bothering with 3D sets that require glasses is beyond me given the recent studies that show overwhelming customer dissatisfaction with the experience of wearing 3D glasses. Their recent announcement about developing 3D displays that don’t require glasses sounds much more promising. Toshiba also released the non-3D VX700 series of LED HDTVs which come in 55-inch and 46-inch sizes. The VX700 series have a slightly lower dynamic contrast ratio at 5M:1, but like the WX800 have built-in Wi-Fi 3rd party apps support. 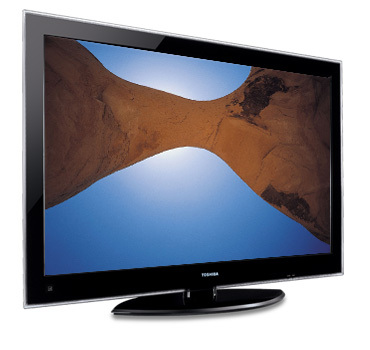 The HDTVs also feature Toshiba’s ClearFrame 120Hz technology, with Expert Model and ColorMaster for color and gamma controls.